The assassination Thursday of Lebanese writer and activist Samir Kassir has sent a huge shockwave throughout Lebanon, because of its timing, target and implications. A country on the road to peaceful national revival and reconstruction has found itself still mired in murderous political retribution and intimation. The powerful, angry reaction of all Lebanese and others around the world to Kassir's killing reflects both the valor of the man himself and the gravity of the battle at hand throughout the Middle East. In the great contest that has defined the modern Arab world since the 1950s - the struggle of biology versus ideology, and of security versus liberty - Samir Kassir will be remembered as a courageous warrior and a leader in many respects. Though emotions are high, and powerful sentiments of anger and grief affect us, it is important to maintain a focus on the nature and the conduct of the battle at hand, as much as on the warriors on the field of battle at any one time. The battle of biology versus ideology pits brave Arab men and women against powerful state, security and ideological forces that would snuff out an individual life in favor of maintaining the status quo power structure. Samir Kassir's crime in the eyes of those who killed him was impudence and impertinence, reflected in his spirit of bold, persistent insubordination to those in authority who want to dictate to all citizens not just how they should behave, but what they should think and say. He believed that security emanates from the web of ordinary human beings and citizens who live in dignity and liberty, not from networks of arms and officers that relegate the worth of a human life to third place behind imperatives of enforced order and perpetually incumbent power. He wrote words on paper, and spoke in public meetings and the mass media. He challenged the prevailing security order in Lebanon, Syria and the rest of the Arab world simply by speaking out in public against it and what he saw as its demeaning, dehumanizing excesses. In so doing he was a model of courage, clarity and honesty, attributes that are being acknowledged by the immense public outrage at his killing. The truly historic element in his life and activism, it seems to me, was his insistence on challenging the security and police systems, at a time when few dared to do so and instead spoke gingerly of reform, democracy and modernity. When Lebanese public tensions rose to a higher level last summer on the rumors that President Emile Lahoud's term might be extended, Samir Kassir and some of his colleagues were among the first to speak out against this idea, demanding an end to governance by security mindsets and mechanisms. In the months to follow, after the attempted killing of Marwan Hamade and the assassination of former Prime Minister Rafik Hariri, the ideas he articulated about controlling and limiting the excessive political roles of Arab state security services suddenly became mainstream demands of the people of Lebanon, the international community and the UN Security Council. This was the measure of his victory during his own life. He did not do this alone, of course, because many other brave Lebanese in politics, religion, the media and academia also spoke out. But in retrospect, there was something pioneering and special about his own determined activism. I sensed this during my several meetings with him, and when we had a chance to speak at conferences or dinner tables during the past few years. I can only call the quality that defined him a sense of courage and fearlessness, anchored in a quiet certitude and self-confidence. His freedom from fear of the consequences of his activism was a measure of the depth of his convictions - and that is what inspiring others is all about. He simply knew in his bones that his assertion of the rights of individuals and citizens to live in freedom and dignity, and his rejection of security-managed state governance systems, was not the fringe sentiment of romantic individuals like himself. He articulated the collective demand of nearly 300 million Arabs who instinctively share the values that he put on paper or spoke on television. His fearlessness was anchored in his legitimacy, his articulation in public of the private thoughts of millions of people who were too afraid to say what they believed. Others will be killed or intimidated as the battle for a dignified political and economic order continues in the Arab world. The spirit of fearlessness that animated Samir Kassir and others like him in different Arab countries has now transcended the bravery of individuals, to infest the minds of entire citizenries. This is increasingly manifested in daring public protest movements in assorted Arab cities. It is no coincidence that Lebanon and Palestine - the two tortured lands that framed Samir Kassir's life - are the two best examples to date of societies whose citizens have risen up en masse to assert their right to live in decency, dignity and self-determination. 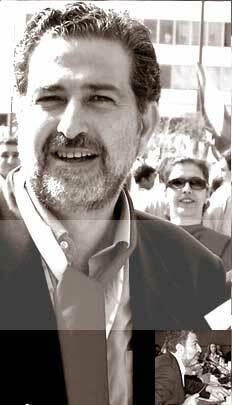 Samir Kassir is biologically dead, but ideologically triumphant. Those he inspired and mobilized through his example will continue to wage the larger battles of security and ideology, in Lebanon and other Arab lands. His cruel death will hasten that process and the day of victory, because his life reflected the irreversible tipping point where private courage is transformed first into public political force, and ultimately into official state policy.